Deadlines, deadlines, deadlines. Haven't been able to post as regularly as I'd like. 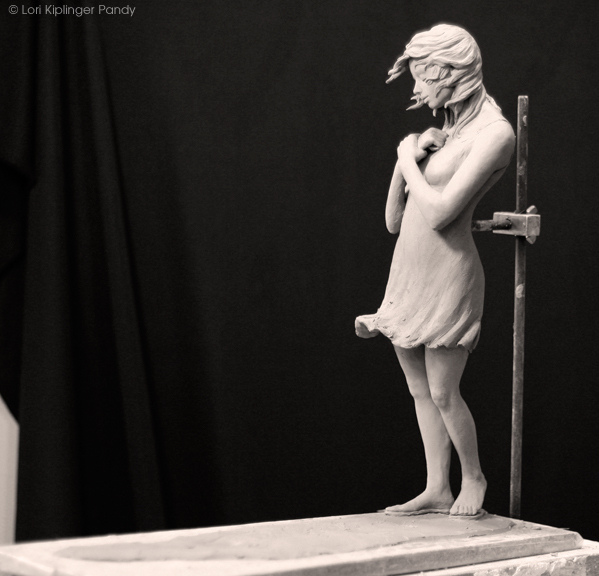 So - back to the sculpt of "Loss". I did some extra work and ultimately wasn't needed and wasn't diligent enough of photo. For instance I fully sculpted both ears - which are completely covered by the blowing hair. But sometimes you change direction with work and the ears may have shown - at the very least they are a form that takes up space under the hair, so their presence is still felt. I also sculpted the hands and arms several times - trying to get just the right pose. 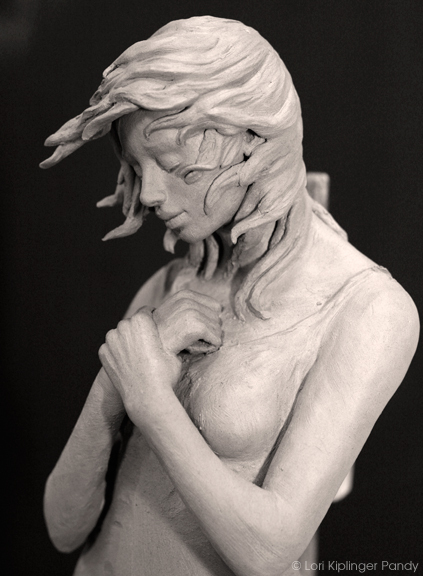 The tendrils of blowing hair are tricky - casting shadows upon the face, which is fine with me, however may be a problem in casting in bronze - I'll be checking with the foundry. The costs of casting increase dramatically with extra work, so it's a delicate balance. You'll see in the full length images that she is standing on a long base, which is her shadow. This is how the emotion of loss feels to me - engulfing and swallowing (shown by the hair and dress swirling about her) with nothing but darkness ahead - represented by the long shadow. The shadow has a hole it in - the feeling of a hole in your heart. Now that the forms are in place and proportions set I will take some time to refine the entire piece and then take some photos with better lighting. 15" high by 16" long in waterbased clay.